So I am right into cosy chilled evenings at the minute. Most of you may already know that I am working on self-care for 2019 and daily improving my life. That doesn’t mean I am out every night, climbing a mountain or anything like that. It just means I want to take care of myself better this year. Evenings are a time for me to spend alone, or with loved ones. Its a time where I can destress, unwind and relax in the comfort of my own home. I get in from work at about 5:15pm. I am very lucky that I only live 10 minutes away, 15 depending on traffic. As soon as I get in, I put my bag, keys and water bottle in my kitchen come living room. I put my coat on the hook in my bedroom and take my boots off. Depending on how cold it feels I tend to put my dressing gown on over my clothes. Classy I know. If I am having a bath that evening I will turn the boost on the hot water. Its then time for me to cook dinner. At the moment dinner seems to be really random and I have been craving junk food a lot. But I am pushing myself to eat healthier and a variety of non meat and meat options. Tonight I had broccoli, pasta and mozzarella. Simple and cooks in 10 minutes. Broccoli is a vegetable that I ever love or hate. I think thats due to my mum feeding me daily for ages. I went off of it for a long while now its back being a favourite. 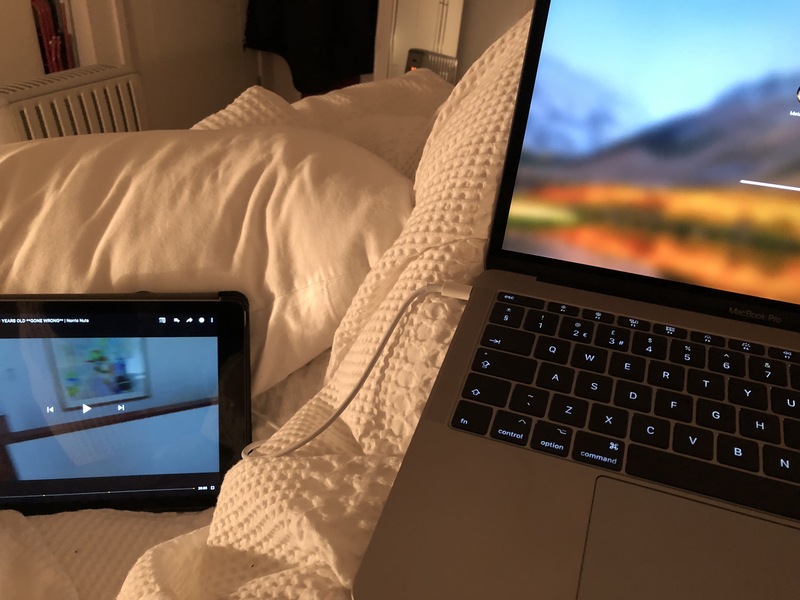 I will eat my dinner, watching youtube on my iPad or on my Apple TV connected to the tv. Its a time of peace and quiet, time to scroll through instagram or just chill out eating the random concoction I have put together to call dinner. It really helps me to eat slowing and preferably up the table compared to the sofa because I am getting a lot of heartburn recently. Once I have eaten and finished an video, I have to clear away. I am 100% wanting to keep on top of being organised and tidy for 2019. Something thats become a bad habit is living from the dishwasher. As soon as its finished now I have to empty it so its ready to reload with the dirty plates. It also makes you feel better when you wake up go to put the toast on and have no pile of washing up to deal with. After dinner and tidying away Its a time for me to do what I feel I need to do. I have from 6-10pm really to pick and choose as I wish. It all depends on what I need to accomplish and what my body is telling me I need. Most nights I need to watch some youtube videos, the tv, read, meditate and work on my blog. 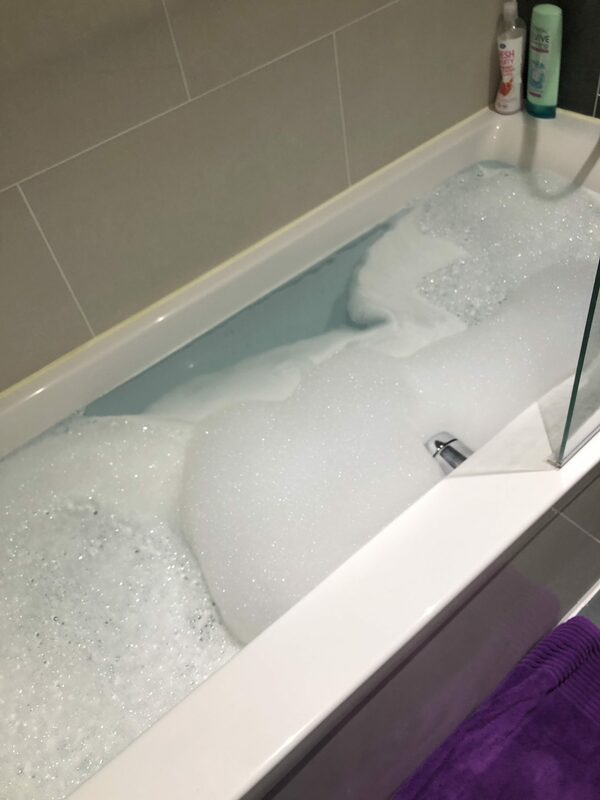 Its about 6pm when I decide to run myself a nice hot bubble bath. 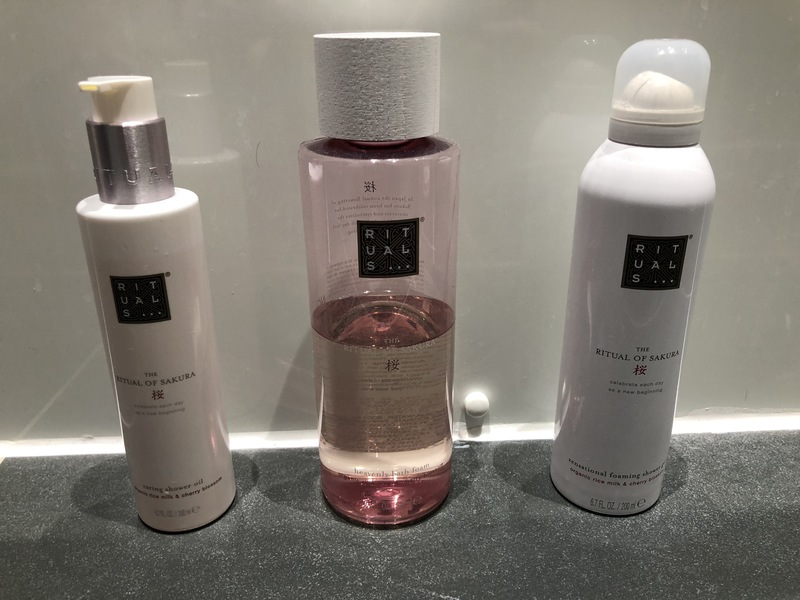 I mainly use *rituals Sakura bubbles. They are amazing. I light my yankee candle in clean linen and its time for me to relax and most of the time I drift to sleep a little or meditate. I can be in the bath for ages. Especially if its the perfect temperature. This time locked away in my bathroom is a time, I have no phone, no laptop or iPad, no one wanting anything and a time I can unwind, think things through, meditate and not be disturbed. Meditation really is key in my self-care and doing it daily especially if the day has been bad it really can take that weight off your shoulders. Even to lay and just think of the good things, what you love or an amazing place you’d prefer to be right now. Its massively helps. After my bath and this will make you laugh, I put my two onesies on. One because its cold here in the UK and my flat seems to let all the heat out and two because they are comfy and so good for my stomach. It also means I am ready for bed. Between 6:40pm and 8pm roughly I tend to watch tv or sort out things I need for the next day. I tend to get food out the freezer for dinner the next day and be organised. I can sit and text on my phone with my friend for ages, I can play games whatever. A random mixture mainly. If I have a programme on the TV I want to watch my plans change a little but this is pretty much adaptable, swapping an hour for an hour. This bit of me time is so good. I can catch on so much. At about 7:45pm I get my app headspace open on my phone and set it to meditate with me for 15 minutes. I found headspace through my pain specialist actually but also through a book I was reading at the time. Its helped me learn to meditate and become stronger. It also allows to help yourself more, understand your bodies needs and love yourself more. By 8pm or I at least try for an hour to be active or writing, editing a post for my social media. When I am ‘working’ I also tend to have a bag of cheese and onion triangles and put on a face mask. My face is so dry at the minute that its good to have my little skincare going daily. If I am putting an over night mask on then I obviously do this at bed time instead. 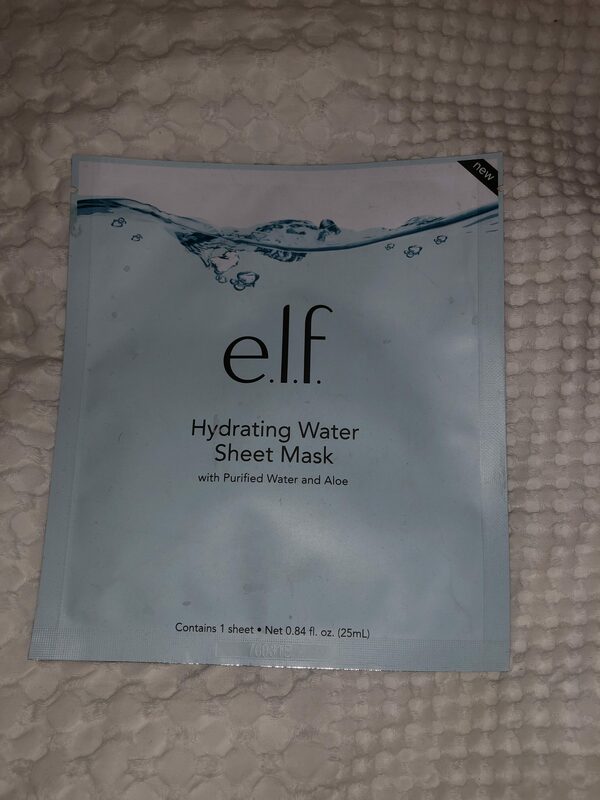 But right now as I type this I have a sheet mask on. At 9pm that is it. No more connection to the world. I put down everything and its time for to unwind. 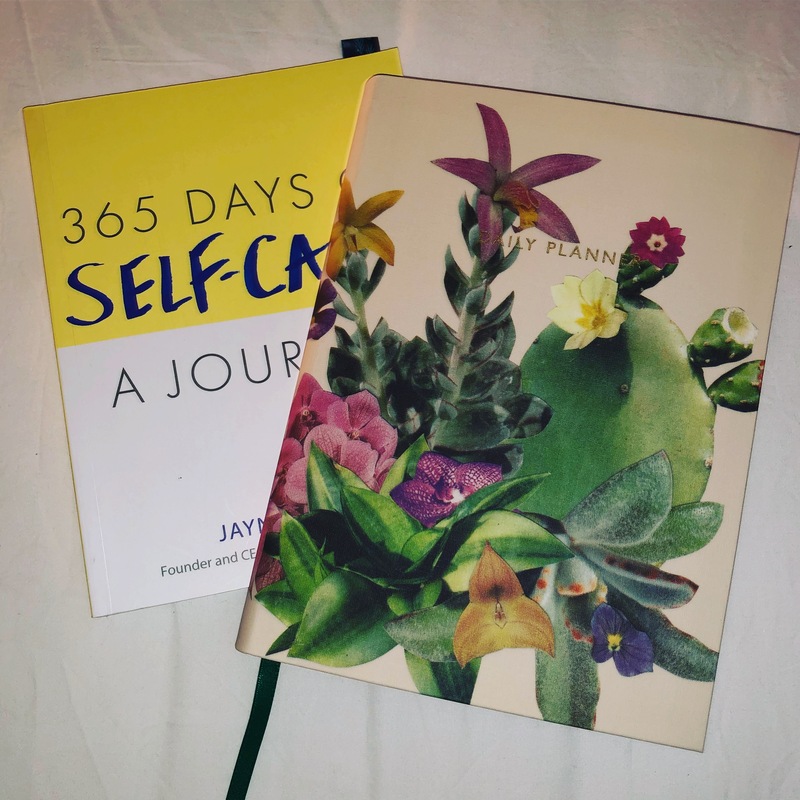 I start by writing my *365 days of self-care journal and my bullet journal. This doesn’t take long but it is helping me through the good and bad days. Its also good to look back on and reflect, or see how to improve the bad days. By 9:45pm I am really tired. This is the time for me to say nun night. I go to the toilet, brush my teeth, take my medication. Plug in what needs to be plugged in and be in bed and asleep by 10pm. 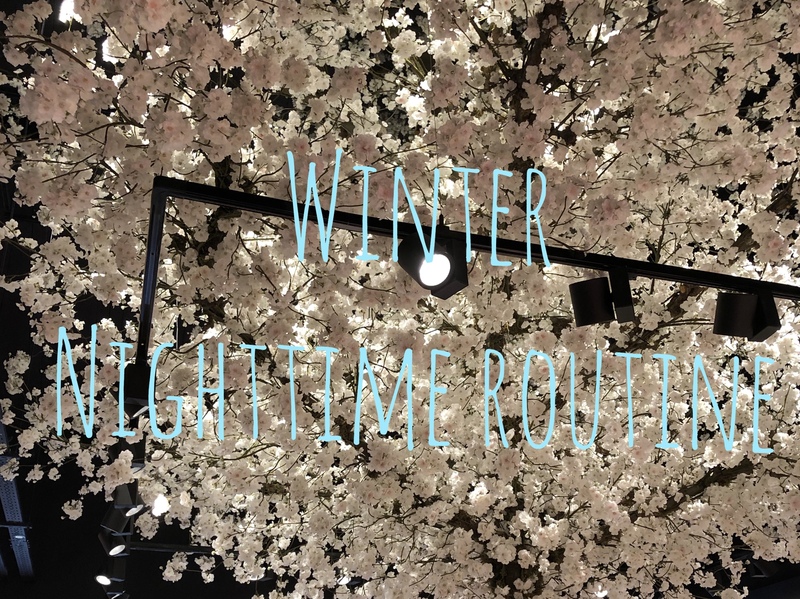 So thats my winter’s nighttime routine. Is yours similar or are you one to be out and about each night? I just don’t like the cold, don’t get me wrong I will go out and do, but I much prefer time at home. I hear a lot about Ritual Skincare from Fleur de Force I believe it is — she seems to really enjoy their stuff. Your evening routine sounds so relaxing! I remember those days well and it’s so great to take care of yourself and get sleep. Hoping one day to get back to that when my toddlers are bigger and realize how great sleep is! I would love to fall asleep by 10pm. Have you always found it easy to fall asleep that early? And how are you liking the Headspace app? I’ve thought about signing up. Yes I have always been asleep by 10pm but I am finding that the hours wind down time is helping me to have a better and deeper sleep. I wake at about 5 then just roll over till my alarm wakes me for work or weekend about 9:40am. I use pillow spray and sleep oil which help massively too. Yes definitely would recommend headspace. I would say don’t pay for it straight away trial the 10 free sessions and this helps and teaches you meditation really. Then I tend to just repeat them 10 sessions adjusting the time. But I am thinking of signing up for more sessions. Your evening routine sounds very much like mine!! Nice post! Your nighttime routine sounds fantastic! I really need to add some of these steps into my own routine. Thank you. This routine is really helping me.